"MaMoni – Integrated Safe Motherhood, Newborn Care and Family Planning Project,” aims to increase the practice of healthy maternal and newborn behaviors in a sustainable and scalable manner. Save the Children is the lead organization implementing the MaMoni Project, while Jhpiego provides technical assistance in family planning and quality improvement. Jhpiego began working in Bangladesh in 2006 as a partner with Save the Children under the ACCESS Program—funded by the U.S. Agency for International Development (USAID)—focusing on improving maternal and newborn health (MNH) in seven sub-districts of Sylhet. In 2009, the USAID-funded Maternal and Child Health Integrated Program (MCHIP) received an associate award building on the ACCESS work, with the goal of improving maternal and neonatal outcomes in Sylhet and Habiganj divisions. MaMoni Program supports Aponjon through its Mamoni program in 2 Districts by engaging 68 community agents for enrolling subscribers for Aponjon service. BRAC Health is an integral component of BRAC’s development intervention since its inception in 1972. By improving the health of the people, especially the poor, and promoting the capacity of a community to deal with health problems, the health program contributes to achieving BRAC’s twin objectives of poverty alleviation and empowerment of the poor. Over the years, BRAC’s health programs have evolved in step with the national and global health priorities and changing knowledge base. From its founding days, healthcare interventions have been an integral aspect of BRAC’s holistic and rights based approach to development. The two major objectives of the BRAC Health Program are to improve maternal, neonatal and child health, and to reduce vulnerability to communicable diseases and common ailments. The BRAC Health Program is a combination of preventive, curative, rehabilitative and promotional health services. BRAC has the largest field level presence for primary health care support to rural Bangladeshi beneficiaries. BRAC Community Health Agents facilitate rural subscribers to enroll with Aponjon service In 101 upazillas of 16 districts with total 1373 agent’s up to June, 2014. The USAID NGO Health Service Delivery Project (NHSDP) is the United States Agency for International Development (USAID) Bangladesh’s largest health initiatives; it is the latest in a series of project that begun in 1998 with an objective of improving the ability of local non-governmental organizations (NGOs) to provide basic health services to the poor. This USAID flag-ship program is implemented under a contract between USAID and Pathfinder International, partnering with 26 NGOs that operate 330 clinics and 8,838 satellite (outreach) sites in urban and rural areas across the country. NHSDP’s overall goal is to enable Bangladeshi NGOs to improve health status of the poor and underserved population by providing cost effective quality health care services as well as to complement GoB efforts to improve maternal, newborn, child health and family planning status. ‘Infolady’ is an entrepreneurship program from Dnet that contributes to achieving twin objectives of poverty alleviation through improved access to information and knowledge as well as empowerment of rural women and poor. In order to make a significant contribution in the rural livelihoods a new model of rural educated women entrepreneurship model called Infoldy was initiated in 2006. There are hubs who are administering the Infoladies. A typical Infolady is a trained rural young woman, who rides a bi-cycle about five to ten kilometers a day and offers variety of ICT-based and essential services at the door-step of rural community she lives in. The Infolady carries a range of ICT equipment with her. These include a netbook computer with webcam, digital camera, and mobile phone with internet connectivity and a headphone. She also carries weight measurement machine, blood pressure machine, blood testing kit, pregnancy test kit, sugar test kit etc. The Infolady has been proven as the credible trust agent to thousands of rural women, who visits individuals and different groups of community people. She is supported with a range of offline and online knowledge and useful information for women. Infoladies offer services to various target groups: pregnant women, farmers, children, adolescent girls through various ICTs and offline formats. They offer specific information and communication services, which provide crucial actionable information related to health, education, farming, job search, specific agricultural inputs, legal aid etc. They also provide contraceptives and sanitary napkins to the rural women, who generally do not visit shops to purchase consumer products due to social and cultural reasons. Infolady program aims to deploy at least 2 to 3 Infoladies in each of the unions throughout Bangladesh by 2015 through franchise system. These Infoladies will be attached and supervised by local hubs based in Upazilas who are the franchisors. Fair Price International Pvt. Ltd. with technical support of D.Net is responsible for franchisee. Info-ladies have included ‘Aponjon’ into their service portfolio for rural women. This collaboration will facilitate Aponjon to enroll new subscribers and Info-lady to earn service income inn form of per registration incentive. Social marketing in Bangladesh was initiated to challenge the rapid population growth by marketing contraceptive products widely accessible at a price affordable to the general population and bring about behavioral change through extensive mass media and local level promotion The major programs of SMC implements include family planning, child survival, maternal and child health and STD/AIDS prevention program. In addition, SMC implements customer education and health communication programs. 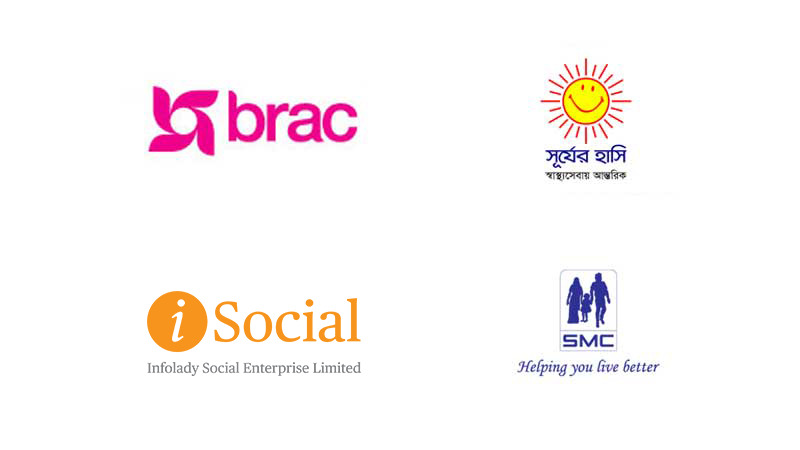 SMC is now regarded as a significant contributor to the reproductive and child health services in Bangladesh by complementing the public sector distribution with private sector social marketing model. In 2011, SMC provided 3.49 million Couple Years of Protection (CYP) through offering three modern methods – oral pills, condoms and injectables. As BDHS shows, 35 per cent of the modern contraceptive users reported that they use SMC brands. Under its family planning program, SMC social markets a variety of oral pill brands (Combination 3, Noret-28, Femicon, Minicon and Femipil); and condoms (RAJA, HERO, Panther, Sensation, and U&ME); and clinical (Injectable “SOMA-JECT”) contraceptives. To make contraceptive products available and affordable to the less-privileged people of the country, SMC positions its brands of contraceptive products at different price segments so that revenue generated from the moderately priced brands can cross-subsidize the lower-end brands. In May 2008, SMC introduced a micronutrient powder in the brand name of “MoniMix” to address childhood Iron Deficiency Anemia (IDA). It also started marketing Zinc dispersible tablets in September 2008 to reduce the severity of diarrhea in children under 5. As part of its maternal and neonatal health program, SMC launched Safe Delivery Kit branded as “Safety Kit” in 2008 to ensure clean child delivery at household level. The collaboration between SMC and D.Net is mutually benefiting by expanding customer base of products and services.